Looking for a Used Equus in your area? 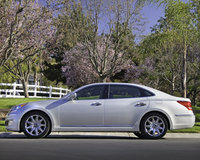 CarGurus has 272 nationwide Equus listings starting at $7,900. How, you might ask, can a Hyundai be compared to, for instance, a Lexus, a Mercedes or an Audi? Well, the 2015 Hyundai Equus full-size luxury sedan is how. While it may not carry the cachet of those Euro-styled legends mentioned above, this 5-passenger luxury limo remains equally well-endowed with power, pizzazz and princely provisions, all at a comparatively stingy MSRP. Alas, unlike its next-gen Genesis stablemate, with which it shares its touring-oriented underpinnings, the Equus lineup, consisting of the loaded Signature and the even more posh Ultimate trims, is essentially unchanged for the upcoming model year. But don’t worry, this posh 4-door’s hefty cabin room remains complemented by 16.7 cubic feet of trunk space, and the standard rear-wheel-drive (RWD) configuration ensures the biggest bang for the buck from the standard 5.0-liter V8 powerplant. That’s right, this big V8, again mated with the over-the-top 8-speed shiftable automatic transmission, returns to throw 429 hp and 376 lb-ft of torque at you, while the standard driver-selectable air suspension system can be adjusted to Normal, Sport and Comfort modes to suit the mood of the moment. But what about mileage, you ask? Expect a fairly decent 15 mpg city/23 highway from the variable-valve-timed (VVT) V8, along with a 0-60 time of around 5.6 seconds. To get back to the posh, this Hyundai starts earning its celebrated spurs with the Signature’s standard 19-inch alloy wheels, LED fog and daytime running lights, reverse-tilt heated power-adjustable mirrors and power sunroof. And that’s just on the outside. Inside, look for premium leather upholstery and accents, along with alloy and wood cabin trim pieces, all complementing full power accessories, heated and ventilated power-adjustable front seats, reclining rear seats and tri-zone climate control. Additionally, adaptive cruise control (with pre-collision braking) returns in this allegedly lower-level Equus, as do power-adjustable telescoping tilt-wheel steering, front and rear parking sensors and a rear-view camera bolstering the auto-dimming rear-view mirror. And then there’s memory for driver’s settings, not to mention Hyundai’s Blue Link infotainment system, which interfaces with Bluetooth for destination downloads, hand’s-free calling and concierge services. And let’s not forget the standard Lexicon premium 580-watt audio system with its 6-CD changer, 17 Surround Sound speakers, HD satellite radio, video monitor and multiple USB ports, or the standard GPS navigation suite with its accompanying 9.2-inch touchscreen monitor. Not enough, you say? Then stroll over to the 2015 Equus Ultimate to find such standard add-ons as power-activated soft-close doors, a power trunk lid, full LCD instrument panel, forward facing and side-view cameras, ventilated rear seats, a head-up windshield display and rear-seat DVD entertainment. Furthermore, to prove that its 2015 Equus high-end sedans are the epitome of luxury and value, Hyundai, interestingly enough, offers no optional features with either trim. Moving on, standard safety equipment for the 2015 Equus duo includes 4-wheel antilock brakes, traction and stability control, front and rear side-mounted airbags, front and rear head airbags, a driver’s knee airbag and active front headrests. Additionally, Blue Link emergency communications, LED front fog/driving lights and daytime running lights, turn-signal-integrated mirrors, pre-collision braking and self-leveling high-intensity-discharge (HID) headlights also come standard with each trim. Finally, in keeping with its princely persona, this posh sedan, in either trim variation, also sports standard lane-departure alerts and blind-spot monitoring, while a remote antitheft alarm is also delivered as part of the standard safety package. What's your take on the 2015 Hyundai Equus? Marvin A barely warmed-over 2014 model that does not compare well with its near-relative the Kia K900. 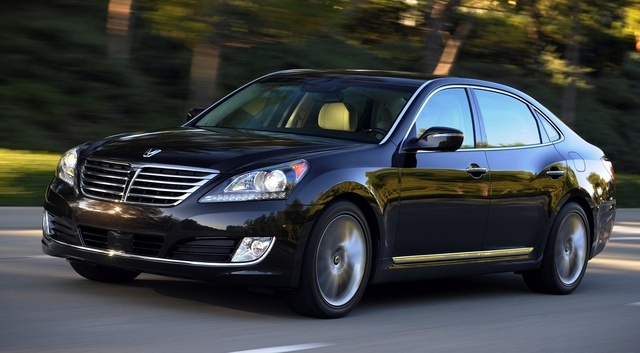 Users ranked 2015 Hyundai Equus against other cars which they drove/owned. Each ranking was based on 9 categories. Here is the summary of top rankings. Have you driven a 2015 Hyundai Equus?